When development is typical, infants at around six-seven months begin to show signs of an insatiable drive to grow…to stretch, learn and explore. Parents, in turn, are instinctively ready to promote this growth and eagerly provide opportunities for the child to explore: a natural feedback loop that we don’t even give a thought to. It just happens. Typically developing kids learn how to interact socially and think flexibly (and therefore behave adaptively) during the many hours of playful fun they have with their care-givers in the early years inside this reciprocal ‘feedback loop’. We know exactly how this happens because it has been studied by anthropologists and psychologists and other clever ‘ologist’ boffins. Barbara Rogoff, a Professor of Psychology at Santa Cruz University, coined the term ‘Guided Participation Relationship’ to describe this special feedback loop between child and caregiver that enables the child to collaborate in a learning relationship with close adults which is ‘carried out day after day, without much deliberation or conscious awareness. During the research period that eventually led to the development of RDI, Dr Steven E. Gutstein studied many families of children with autism and concluded that children with autism are unable to take part in the Guided Participation Relationship because autism has derailed the ‘feedback loop’ between child and care-giver. No GPR = no mastery of developmental milestones, because the GPR is the framework for the interpersonal engagement between child and adult that enables those milestones to be mastered. At our school, we use the principles and practice of RDI to guide our pupils, allowing us to have another go at putting the GPR in place. Only when the GPR framework is robustly in place can we start to interact in a way that fosters co-regulation, which is the foundation for all human communication. The child is then able to master the developmental milestones such as joint attention that they missed first time round, enabling them ultimately to take different perspectives and to think more flexibly. For infants with autism, their growth-seeking drive doesn’t develop at the appropriate time and, instead, the drive for stability becomes their norm. Instead of venturing out, these kids shrink back, shy away and pull in. Consequently, they disengage from their parents/carers who are intuitively trying to provide activities for growth. This starts a whole spiral of disappointment, failure, confusion and fear, which causes the guiding relationship, or GPR to break down. 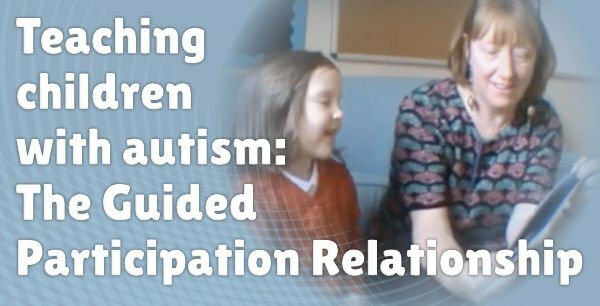 So in order to help kids with autism have another go at mastering missed milestones via the social interaction between parent and child, we need to put the framework of the GPR around them. Be aware of the student’s ‘edge of competence’ so that the activity and any challenges are not going to over overwhelm the student (leading to withdrawal/avoidance due to too much uncertainty) or underwhelm the student (leading to withdrawal/avoidance due to boredom). What does the GPR for autism look like? Here are some clips from Bright Futures School of me putting a GPR framework around Lucy in order to use the social interaction between us to master missed milestones. The first clip is from October 2015, one month after Lucy had started with us at Bright Futures, so I am still testing things out and learning from my mistakes. At 0.01 I hold my hands out to Lucy. This is invitational non-verbal communication. I am not asking her verbally to do ‘Ring-a-Ring-a-Roses’, I am simply inviting her with my gesture. We manage to co-regulate for about 5 seconds before Lucy breaks off. During this time, my role set was ‘same thing, same time’ – holding hands and dancing round. For those 5 seconds, we were in sync, co-regulated. At 0.07, I state declaratively that, ‘We’re not ready for falling down yet’. Here, I am ‘spotlighting’ that our co-regulatory pattern has broken down. This also acts as an invitation for Lucy to repair the breakdown (by re-joining me and re-establishing the pattern). On this occasion she chooses not to, so it is now up to me to decide what to do in order to facilitate her re-engagement. Do I continue to invite her to re-join or do I start another co-regulatory pattern? From 0.10 – 0.25 Lucy is avoiding interaction and I am waiting, without placing any pressure or demands on her. At 0.25 the doorbell goes and I think this stimulates her into action. Lucy trots across the room, verbalising, and I continue to hold my hands out as an invitation to re-join until 0.54 when I kneel down. This is a scaffold on my part, as I am wondering if me being on the same level as Lucy will help her to re-engage. I give up my efforts to enable her to re-join my Ring-a-Ring-a-Roses pattern and set us up for a different activity, which seeks to incorporate her room-trotting and verbalising. The room-trotting activity is only partially successful, with some fleeting and unsustained co-regulation, so I try reading. We can see at the beginning of this clip that Lucy is avoiding engagement again. It is understandable that she is doing so, as there is a lot of uncertainty for her, both around the activities that we are doing and the fact that she is working with me, a new person. At 0.08 I think I hear Lucy say ‘Maisie’ which is one of her favourite books. I incorporate her suggestion into my framework of the GPR…….I am aiming for us to read together. It doesn’t matter what we read. At 0.20 I state declaratively that I don’t know which one Lucy wants. This acts as an invitation for her to choose. At 0.26 I begin to replace my verbal communication with non-verbals, using facial expression and gesture to denote what I want to communicate. At 0.48 Lucy moves to pick up the Maisie book, showing me that it is that one that she wants to read. I hold onto the book (limit setting) because I know from experience that if I let her take it, she won’t share it with me and if we don’t have a shared activity as the focus of our attention, I will not be able to facilitate co-regulation. At 1.05 I mis-read Lucy’s gesture – on reflection I think she was trying to help me by pushing my glasses up my nose. In the moment, I mis-read her touch to mean that she wanted to try my glasses on. At 1.07 I pat the sofa next to me – a non-verbal gesture inviting Lucy to sit next to me. She perceives this as a demand and avoids it by doing headstands instead! At 1.26 I say declaratively that I can’t read upside down and move a little closer (scaffold), which again spotlights the invitation to sit by me. I wait for her to decide when and whether to re-join. At 2.57 (nearly 1 min 30 later), Lucy joins me. At 3.02 Lucy goes to turn the page and I say ‘It’s not time yet’ as I am seeking to be able to say something about each page before Lucy turns the pages. That is my pattern...so our role set is ‘different thing, different time’ as I am reading and after that, she is page-turning. 3.04 Lucy is using, ‘when it’s, when it’s...’ to regulate herself around the uncertainty of not being in control of the page-turning timing. At 3.13 I offer the page to Lucy, facilitating her to step into her role. At 3.28 Lucy is ready to turn the page without me having read anything. This would not be within our co-regulatory pattern so I hold onto the page so that she can’t turn it. At 3.31 I say ‘ahem’ to draw Lucy’s attention and she references me (looks to my face for information). I shake my head to let her know it isn’t time yet. At 4.02 I offer the page to Lucy as I have had my turn (reading). I do the same at 4.28 after we have had a nice verbal exchange about the picture. At 4.40 Lucy goes out of turn again and I use non-verbal communication and then a verbal ‘not yet’ to spotlight that it isn’t time yet. At 4.47 Lucy disengages by moving onto the floor, so I sit back and pat the sofa next to me to invite Lucy to re-join me on the sofa. She does. At 5.05 I confirm that it’s time to turn the page by nodding, saying, ‘uh hmm’ and offering Lucy the corner of the page so that she can step into her role. So here, with the GPR framework in place, I have been able to support Lucy to use social referencing, and to start to co-regulate by stepping into her role of taking turns. Without the GPR framework in place, it would have been impossible for me to achieve this. It looks easy, but it takes an awful lot of practice because the tiniest mistake or oversight on the guide’s part can throw things totally out of whack and then everything comes tumbling down (I’ve had that happen plenty of times). For me, and for the staff at Bright Futures School, video recording and the ongoing feedback of a qualified RDI Consultant has been the key to our progress and to the ability of our students to master co-regulation. In my next blog post, I will share some different footage of the GPR to illustrate that the framework can be put around a variety of activities and (if I have parental permission to share) across different children and young people.